Lionel Messi scored twice as Barcelona maintained their Spanish league title challenge with an unconvincing home win against bottom side Real Betis. 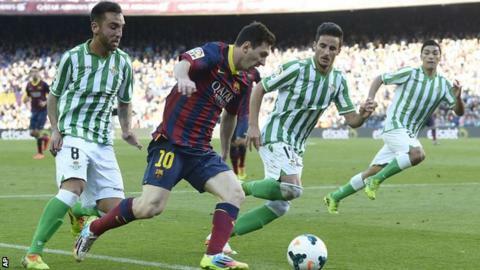 Messi put Barca ahead from the penalty spot after Alexis Sanchez was fouled by Betis defender Jordi. Barca doubled their lead when Jordi diverted Sanchez's intended pass to Pedro past his own goalkeeper Adan. Betis responded inside a minute through Ruben Castro before Messi converted after Adan saved his second spot-kick. The final whistle at the Nou Camp was greeted with a sense of relief by the home supporters after a tumultuous week for the reigning La Liga champions. The Catalan club's reputation had taken another blow after they were given a 14-month transfer ban - which they have appealed against - by Fifa. But, back on the pitch, they moved back to within a point of leaders Atletico Madrid, who clinched a narrow 1-0 home win against Villarreal earlier on Saturday. Third-placed Real Madrid remain two points behind Barca with a 4-0 win at Real Sociedad. later on Saturday. Match ends, Barcelona 3, Real Betis 1. Second Half ends, Barcelona 3, Real Betis 1. Attempt missed. Francesc Fábregas (Barcelona) right footed shot from the centre of the box is close, but misses to the right. Assisted by Lionel Messi following a fast break. Goal! Barcelona 3, Real Betis 1. Lionel Messi (Barcelona) right footed shot from the centre of the box to the centre of the goal following a set piece situation. Penalty conceded by Antonio Amaya (Real Betis) with a hand ball in the penalty area. Foul by Lorenzo Reyes (Real Betis). Braian Rodríguez (Real Betis) wins a free kick in the attacking half. Substitution, Real Betis. Braian Rodríguez replaces Leo Baptistao. Corner, Barcelona. Conceded by Juan Carlos. Rubén Castro (Real Betis) wins a free kick on the left wing. Substitution, Barcelona. Neymar replaces Pedro. Substitution, Barcelona. Francesc Fábregas replaces Andrés Iniesta. Offside, Barcelona. Xavi tries a through ball, but Pedro is caught offside. Antonio Amaya (Real Betis) is shown the yellow card for a bad foul. Foul by Antonio Amaya (Real Betis). Alexis Sánchez (Barcelona) hits the bar with a right footed shot from the right side of the box. Assisted by Lionel Messi. Corner, Real Betis. Conceded by Sergio Busquets. Foul by Andrés Iniesta (Barcelona). Juanfran (Real Betis) wins a free kick in the attacking half. Hand ball by Lorenzo Reyes (Real Betis). Attempt missed. Lionel Messi (Barcelona) left footed shot from the centre of the box misses to the left. Assisted by Adriano with a cross. Pedro (Barcelona) wins a free kick in the defensive half. Goal! Barcelona 2, Real Betis 1. Rubén Castro (Real Betis) right footed shot from the centre of the box to the bottom left corner following a fast break. Own Goal by Jordi Figueras, Real Betis. Barcelona 2, Real Betis 0. Corner, Real Betis. Conceded by Pinto. Attempt saved. Alfred N'Diaye (Real Betis) right footed shot from the right side of the box is saved in the top centre of the goal. Assisted by Jorge Molina. Attempt missed. Rubén Castro (Real Betis) right footed shot from outside the box is high and wide to the right. Assisted by Juanfran. Substitution, Real Betis. Rubén Castro replaces Cedrick.